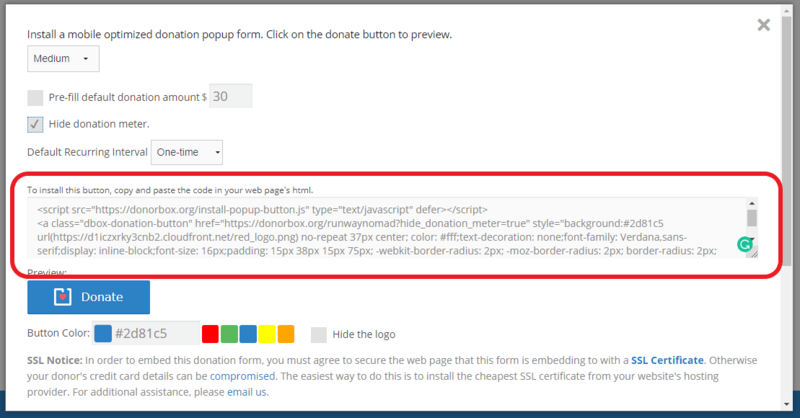 In order to make our checkout process even faster, Donorbox supports modal popup donation forms. 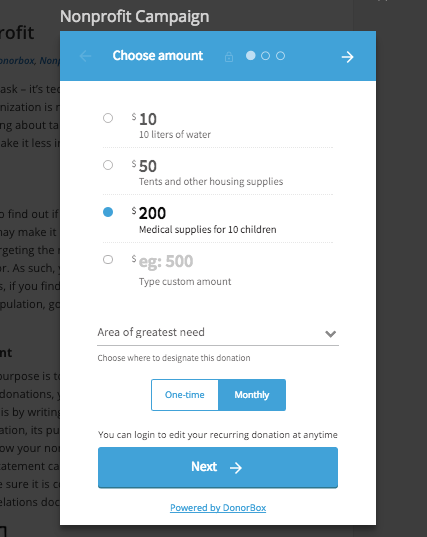 This feature allows your donation form to pop up on the same screen. A donate button will be installed on your web page. When someone clicks it, the popup form will appear, instead of redirecting your donors to a separate donation page. If you’d rather embed a whole donation form into your Squarespace web page, check out our guide here. Go to your Donorbox dashboard. Click the “Popup Form” link to the right of the campaign you wish to embed. When you’re happy with the settings, highlight and copy the code for your form. This code will be pasted in your site later on. Head over to your Squarespace editor. Click the “Pages” button in the left-hand sidebar. Click the “+” button to create your new donation page. 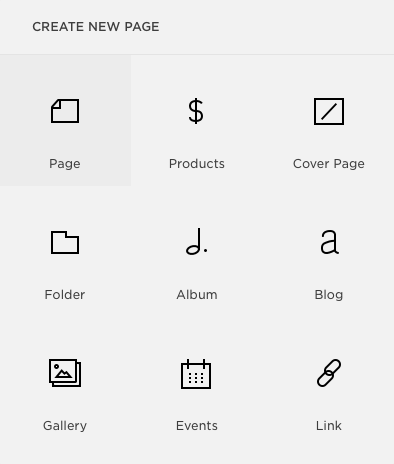 Select the type of page you wish to create. We will be using a classic page layout. Name your new page, then click the “Start Editing” button. 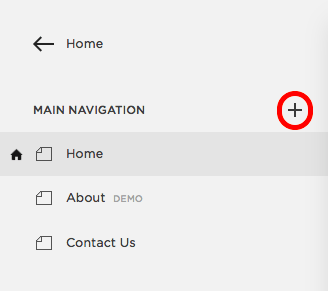 To add content to your new page, click one of the teardrop-shaped buttons on the left-hand side of your page. 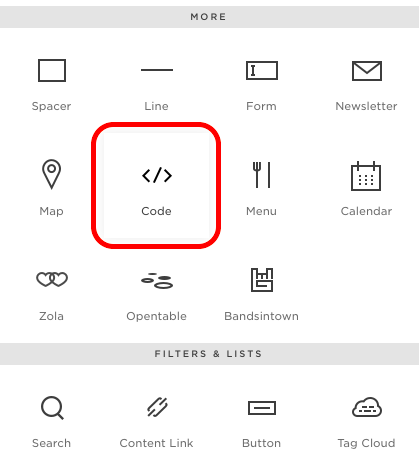 Scroll down to the “More” section of the elements list and choose the “Code” block. 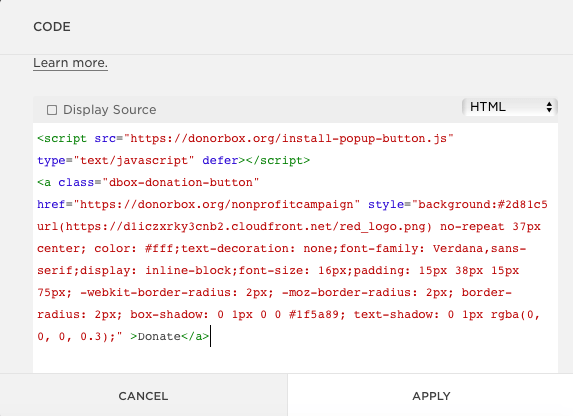 Paste your donate button embed code into the appropriate textbox. Click “Apply”. 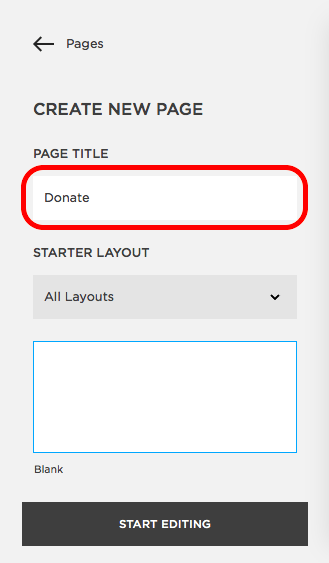 Your donate button should now appear in your website editor. Click the “Save” button on the top left. When you click on your donate button, the modal popup form for your Donorbox campaign should appear on the same screen, making the checkout process even faster for your donors!